The New Zealand Poet Laureate blog: historic! It hasn’t happened before but it should happen again: the gathering of laureates in Wellington last week for Writers on Mondays was a landmark occasion. The National Library put out 270 seats and there were people standing shoulder to shoulder at the back as Chris Szekely and Kate Camp got the evening underway. John Buck detailed the 2008 Te Mata wines we’d been putting away in the foyer beforehand (poetry for the palate). He then launched the two CDs (Bornholdt and Manhire) that inaugurate a series of spoken word recordings from Braeburn Studio/Jayrem Records. Jacob Scott brought the National Library’s tokotoko onstage and explained its design before handing it around for everyone to see and hold. He also introduced Hone Tuwhare’s tokotoko, the famous dipstick made from a piece of an old Te Mata wine press and now in the permanent collection of the Southland Museum in Gore. Then the laureates were called one by one to give an account of their personal tokotoko before reading. 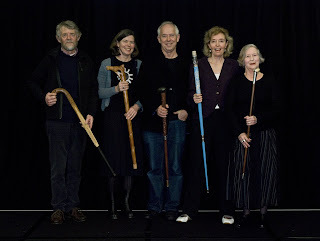 My transformed pool cue (Te Kikorangi) was followed by Brian Turner’s hockey stick (yes, says Brian, it’s a functional walking stick that got him around after a hamstring injury). Jenny Bornholdt’s tokotoko features female symbols of nurture and growth that did not deter her children from using its carved grip as a makeshift gun (these sticks live in the world and take their chances). Elizabeth Smither’s elegant cane, surmounted by part of a Holden gearshift and a carved whale tooth, was next. The poet admitted she liked driving fast but left us to work out the tooth for ourselves. Finally Bill Manhire spoke about the gravitas of the sticks and their function of focusing concentration and eloquence. His tokotoko, the first of the Te Mata sticks, was made from a piece of that same wine press to commemorate Te Mata’s centenary and the inauguration of the laureateship in 1996. There’s a sizeable stone from the Tukituki river on top of it and Bill has become expert at wrangling the stick through airport security post 2001. The poetry? A great pleasure to hear everyone read, and an audience to die for. Some of the poems that were read appear below, courtesy of the poets and their publishers.